Life is full of surprises for Betsi Wyn. She’s trying out lots of things – school dinners, concerts, pirate parties – and all for the very first time. That’s when it’s good to have friends. Like Emyr Rhys, who knows about Welsh cakes and clog dancing. And Mam-gu . . . who knows about everything else! Emyr Rhys’s Welsh cake recipe and Betsi Wyn’s version of Hen Fenyw Fach Cydweli add to the fun in this captivating book for parents and children. This is a charming series of stories about a pair of young children encountering new and sometimes alarming things for the first time: first school dinner, first concert, first Eisteddfod competition. Very lightly written, both children spend a lot of time with their grandparents, who are positive and encouraging role models for the youngsters. This is a lovely read-aloud book, or a good choice for a newly confident KS2 reader (7–9 years old). The text is simple, but flows with comforting repetition and humour; there is a smattering of Welsh, too, appropriately contextualised so meaning is clear for non-Welsh speakers. The cartoon pictures break up the writing, giving this a very pleasing and gentle feel. Well worth a read! 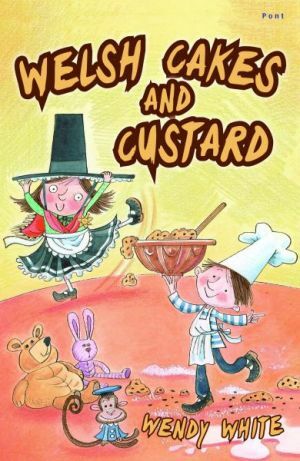 I was thrilled when Welsh Cakes and Custard won the 2014 Tir na n-Og prize, awarded by the Welsh Books Council for the best English-language children’s title with an authentic Welsh background.